Pool, Jacuzzi, Stunning Views at WestWall Lodge! WestWall Lodge is Crested Butte’s finest luxury mountain lodging. A true ski-in/ski-out lodge at WestWall 4-chair lift. All Amenities: Slope side heated pool, jacuzzi, saunas, grill, fire pit, fitness facility and heated garage parking. Front Desk Check In and Concierge Services. Crested Butte.... surrounded by five wilderness areas, with mountain peaks in every direction, gorgeous snowcapped mountains, and some of the world's best mountain biking and hiking! * After a day skiing, hiking, biking, or enjoying one of Crested Butte's Festivals, relax slope side at the pool or soak in the Jaccuzi. * Enjoy the absolutely stunning view of Mt. Crested Butte right outside the French Doors of this studio condo. Beautifully furnished with natural stone surround gas fireplace. * Full kitchen with extra bar seating and a dining area that seats four. * Queen bed with spacious walk-in closet and full laundry facilities. Be sure to visit the historic town of Crested Butte; take a free shuttle just two miles down the mountain . . . enjoy great shopping and dining. Our guests receive the best service with a personal touch so they spend their time making wonderful lasting memories of the Paradise we call Crested Butte! Suitable for couple and one or two small children. Well-behaved pets considered. Stunning view of Mt. Crested Butte through French Doors in living room. We had a great time staying at the WestWall Lodge. The location is great with a hot tub and exercise facility very close to the unit. It has a great view of Mt Crested Butte as well. We have stayed here numerous times and will continue to do so. It is the best place on the mountain. Great outdoor hot tub and pool makes for a relaxing after ski experience. On site ski valet managed by Black Tie is awesome too. Our stay at WWL was wonderful. The slope side location was second to none. Kids and I enjoyed the pool and hot tub in the evenings. The ski valet, cocktail bar and underground parking made activities very easy. The unit is small, but perfect for my 2 kids and me. I would change a few things....tv is too small, very outdated (no smart TV?!?!) and is only viewable from the sofa. Also, condo feels very cluttered with too much oversized furniture placed in odd locations. Definitely could use a little refreshing, but all in all, a great stay! Kitchen was well equipped. Friendly staff. Great location, ski in ski out. My only complaint was the TV. It was dated and too small...time for an upgrade. We very much enjoyed the condo for our recent ski trip. It was well appointed and truly ski in/ski out. The great kitchen and in suite laundry were very convenient. We appreciated the dog friendly attitude as well. We would highly recommend this condo. Absolutely the best location and condo on the mountain. True ski in ski out condo with ski valet service heated garage, gym can’t think of an amenity this place doesn’t have. This condo is great for a couple. Easy access to mountain biking, hiking, and the historic town of Crested Butte. 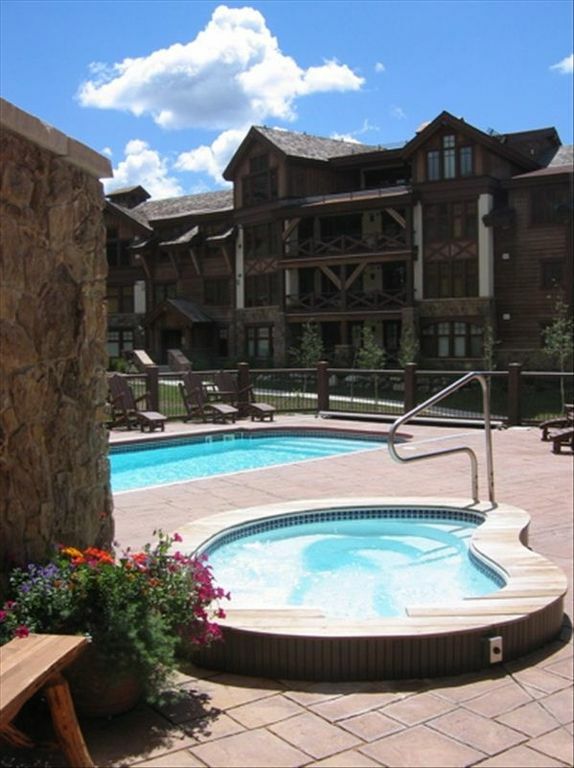 Stunning slope side heated pool & jacuzzi!